Radolfzell, Vienna, Prague – Multilateral development banks have supported no fewer than 82 hydropower projects across southeast Europe, including in protected areas, according to a study by CEE Bankwatch Network released today. The study  finds that the number of hydropower projects in the region that enjoy financial support from multilateral development banks  and commercial banks, is even greater than previously known. Since 2005, the European Bank for Reconstruction and Development (EBRD), the European Investment Bank (EIB), and the World Bank Group have extended loans and guarantees totalling EUR 727 million to no fewer than 82 hydropower plants. This includes 37 projects in protected areas like national parks and Natura 2000 sites, or internationally recognised areas of high biodiversity value such as Important Bird Areas. The EBRD is the biggest known hydropower financier in the Balkans. The bank has supported a total of 61 plants with EUR 126 million, 29 of them inside protected areas, or internationally recognised biodiversity hotspots. 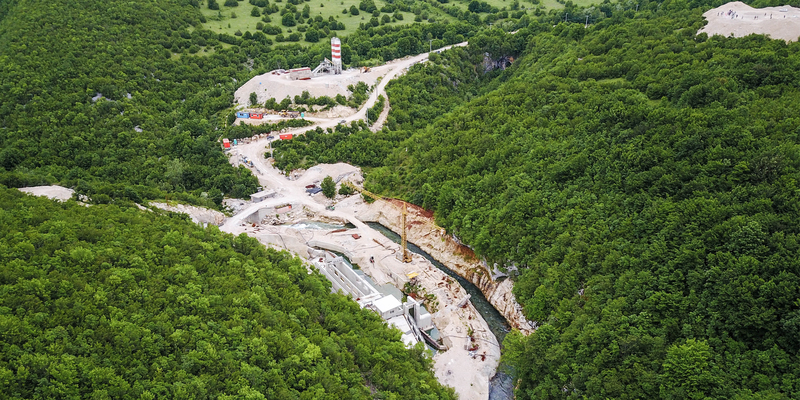 Although the bank has been more cautious in recent years, it is still considering financing for the Babino Selo plant on the Vrbas and Neretvica cascade in Bosnia-Herzegovina, both of which are planned in biodiversity-rich areas. The study, which updates a report released in 2015 , also finds that commercial bank money is playing a key role in enabling controversial hydropower projects. Commercial bank financing is harder to track due to the lack of transparency in the sector, but the study authors have identified 158 plants with such financing, of which 55 are in protected areas or internationally recognised areas of high biodiversity value. The most prolific commercial banks – as far as identified – are Austria’s Erste & Steiermaerkische Bank and Italy’s Unicredit Group, for which 28 loans each were found. Among others, Erste has financed a cluster of seven plants on the borders of Serbia’s Kopaonik National Park. These, together with another eight plants in the area financed from other sources, have left large stretches of the local streams with little or no water for much of the year. “The financiers need to take their share of the responsibility and ensure compliance with local and international standards. Reckless investment decisions can ruin hundreds of pristine Balkan rivers for good,” says Igor Vejnović, Bankwatch’s Hydropower Policy Officer and co-author of the study. “The EBRD and EIB will be updating their environmental and social policies this year. This is a crucial opportunity to tighten their rules and exclude financing for hydropower in sensitive areas,” adds Pippa Gallop, Bankwatch’s Research Co-ordinator and co-author of the study. “The Balkan rivers are of outstanding value within Europe. The dam tsunami is threatening biodiversity and local communities. It is unacceptable that also commercial banks like the Austrian Erste Bank and Italian Unicredit are supporting even the worst projects. They have decent rules on financing hydropower in theory, but aren’t implementing them properly in practice. Many of the plants they have financed would never be allowed in their home countries. They have to stop the financing of hydropower in the Balkans,” says Ulrich Eichelmann of Riverwatch. “The good news is that more than a thousand planned hydropower plants have no financing yet, so there is still much that can be done to save the Balkans’ unique rivers,” says Gabriel Schwaderer, Executive Director of the EuroNatur Foundation. The study and the accompanying databases can be found here. The study covers Albania, Bosnia-Herzegovina, Bulgaria, Croatia, Kosovo, Macedonia, Montenegro, Serbia and Slovenia. It examines hydropower plants which have either been built since 2005 or are now being planned. It is an update of Bankwatch’s December 2015 report on this issue, with expanded information on Serbia, Bosnia-Herzegovina, Bulgaria and the role of commercial banks. A total of 2112 hydropower plants were identified as being planned now or having entered operation since 2005. Most of the plants are only in the planning stage and for 1119 projects we believe that no financing has yet been found. Signed financing was identified for 239 projects and planned financing for 20 more. For 734 greenfield projects we could not trace financing due to the lack of transparency in this field. ‘Plants’ refers to each separate hydropower facility, so one loan or guarantee may cover several plants but still be classed as a single ‘project’ by a financier. The EBRD, European Investment Bank and the World Bank Group (in this case the International Financial Corporation and Multilateral Investment Guarantee Agency).